The Italian Ladies of SHAPE hosted the final Luncheon of the season for the SHAPE International Womens Club. The event began with a cocktail reception in the foyer, which was decorated with logos and pictures of some of the main Fashion Houses creations representing the Modern Italian Style and World. A variety of vendors whose displays with Italian bags, jewelry, Italian products, and paintings attracted the crowds. All accompanied by lovely Italian music. Lunch began when the ladies entered the ballroom through the door of the mysterious wardrobe of the fantasy film "The Chronicles of Narnia". The theme of the luncheon was indeed inspired by this ancient hilltown and commune of the Region Umbria and particularly around "the Race to the Ring", the main feast in the medieval town of Narni. "The Race to the Ring" festival, dedicated to the Patron Saint Giovenale dates back to the first half of the 14th century and takes place each year on 3 May. During this festival, the town of Narni contributes to recreate the atmosphere of 1371, year of the first city laws. Following the rules and regulations, the horse riders participate in the historical "Race to the Ring" wearing their medieval costumes and trying to drive their lances through a silver ring. But why was the door of Narnia represented to enter into the atmosphere of Narni? 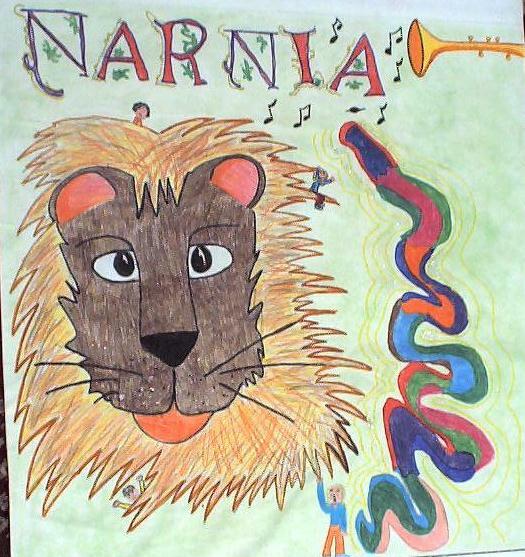 The name Narnia is based on Narni, written in Latin Narniae. "When Walter Hooper asked to Lewis, where he found the word Narnia, Lewis showed him Murrays Small Classical Atlas, which he acquired when he was reading the classics With Mr Kirkpatrick. On Plate 8 of the Atlas is a map of ancient Italy. Lewis had underscored the name of a little town called Narnia, simply because he liked the sound of it. Narnia  or Narni in Italian  is in Umbria halfway between Rome and Assisi". The Italian ladies created an atmosphere that would allow everyone to take an imaginary trip back in time. This is the reason why they created the virtual passage, through the wardrobe door, symbolizing a trip back to medieval times; exactly as it occurred in Lewis novel. The ballrooms decoration the flags, armours, medieval costumes and various decorations were lent by the town of Narni through the precious help of Maj Tommaso Magistretti, a former Shapian. On the stage, four minstrels the "Histriones Carbij" entertained the guests by performing their medieval music. The four brothers came straight from the town of Narni for this special occasion.The stage, on which they performed, was decorated as a corner of a medieval ballroom with its background representing the view through windows of three corners of Narni, all painted by some of the Italian ladies. The 260 ladies enjoyed an Italian menu ably prepared by Mr Di Palmo ROSSI, chief of the restaurant Le Noir Bonnet (in the town of Sirault), who kindly offered his savoir faire and time. He was, of course, helped in the service by the SHAPE Club catering team. As a starter the guests received a risotto ai porcini served in a little parmesan cheese basket prepared by some of the Italian ladies. The main course consisted of turkey rolls stuffed with plums, chestnuts, bresaola and pinenuts. The desert was "panna cotta" served with a soft fruit sauce. The lunch was also a significant event, being the setting for the change of SIWC presidency. Later on, it was the turn of Mrs Rosetta VALZANO, the Italian NMR spouse to address the guests a warm and welcoming speech in French and English. She also took the opportunity to thank the Italian ladies for their tremendous efforts in organizing this fabulous and successful event, "in particular Mrs Eleonora MALAVENDA TOLLA who had been a very precious help", Mrs VALZANO added. 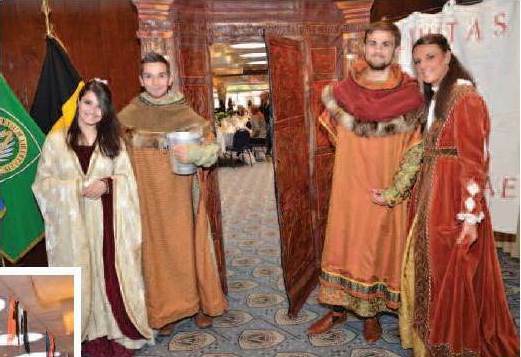 After the main course, some of the Italian ladies dressed in medieval costumes kindly lent by the town of Narni paraded accompanied by the minstrels music. During the lunch also four young people from the Italian community entertained the crowd with the tombola prizes draw. Included amongst the various prizes were : Italian food basket, two bags by MABBIANI, wonderful silk scarves from the last collection by BLUMARINE as well as one wonderful bag, two watercolour paintings, a week-end trip in Lecce offered by Luisa PIO from the B& Breakfast L'Orangerie D'Epoque, and a week-end in Volterra offered by the BASSINI family from the Bed & Breakfast Villa Porta all'Arco. Such a huge event wouldnt have been possible without its sponsors. In addition to those already mentioned in this article, we must particularly thank T&T NATIONAL and INTERNATIONAL movers for their great cooperation in bringing free of charge of all the material coming from Italy, the ITA NMR, the firm FINCANTIERI and silver shop Ciefferbi Argenteria which both offered promotional items, Dott. PICCHIONI di Villa Falconi in Rieti who offered the organic olive oil for the raffle. Last but not least the fashion house of Fausto SARLI offered a fashion book to each guest telling about his life, his career and creations. Fausto SARLI is a leading name in the Italian high fashion scene. Native from Naples, his creations are the symbol of a dress culture that takes its roots in the traditional Neapolitan art of tailoring. His themes are developed with mathematical precision and always enforcing that style which played on form and volume, with its point of departure the circle. In addition, the SARLI fashion house generously offered an amazing gift: a fabulous wedding dress from its collection.The idea is to put this wedding dress up for auction. Of course, the proceeds will go to charity. If interested, call Eleonora MALAVENDA TOLLA at 0489/680615. Overall everybody enjoyed the day and appreciated the warm welcome of the Italian ladies and of course the Italian delicaties. All the guests left the Narnia scene being offered a bag with a silver cornu copia (horn of plenty) and many information leaflets of various regions of Italy that has also contributed to this event, first of all the region of Umbria, then Marche, Veneto, Toscana, Campania, Trentino Alto Adige, Sudtirolo, Liguria, Puglia, Sicilia, Lazio, as well as Enit Sede di Roma e di Bruxelles. Mrs Rosetta VALZANO together with all the Italian ladies warmly thank the numerous ladies for their enthusiastic participation. It is the best award for such a huge work!